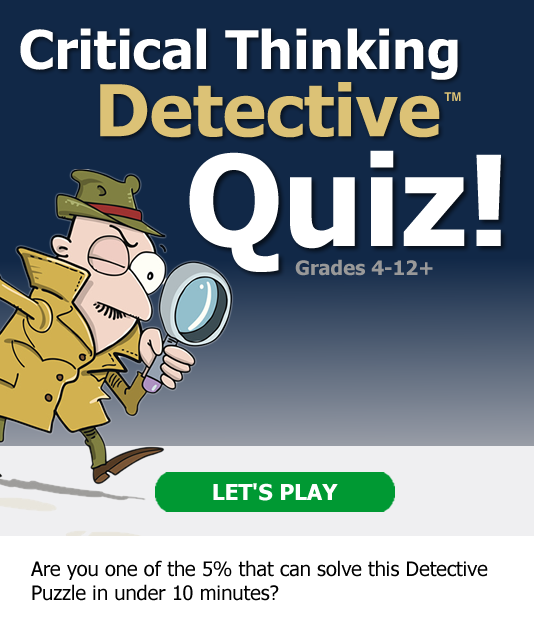 Want More Critical Thinking Quiz Questions? Test your knowledge with questions from our award-winning titles below. 1) You have only an 8-liter jug and a 3-liter jug. Both containers are unmarked. You need exactly 4 liters of water. How can you get it, if a water faucet is handy? Answer: Fill the 3-liter jug three times, each time dumping the water from it into the 8-liter jug. The third time, this will leave one liter of water in the 3-liter jug, and the 8-liter jug will be filled. Dump the water from the 8-liter jug down the drain, and then empty the one liter of water from the 3-liter jug into the 8-liter jug. Now fill the 3-liter jug again and dump the water into the 8-liter jug. The 8-liter jug now contains 4 liters of water. Various answers are possible. 2) What can you add to 1,000,000 and always get more than if you multiplied the 1,000,000 by the same value? Answer: zero, any number less than and including 1.000001, any fraction less than a whole, or any negative number. 3) Determine the common saying depicted in these verbal picture puzzles. 4) What is the 50th number in this sequence? Explain how you got your answer. Answer: 299. The pattern involves a difference of 6 between adjacent terms of the sequence. Add 6 to 5, getting 11, then add 6 to 11, getting 17, then add 6 to 17, getting 23, etc., until 6 has been added 50 times, ending in 299. Answer explanations will vary. 5) Determine both one-word answers. At school you sit on me. 6) The reason he gave the press for leaving his job was illness and fatigue. That wasn’t exactly the truth and it wasn’t exactly a lie. Answer: He was the coach of a professional ball team. The teams owner fired him because he was sick and tired of the teams dismal performance. NOTE: Other explanations are accepted. Per the rules explained in the book one person is supposed to know the actual answer and the player(s) must ask "yes" or "no" questions to deduce the answer. This sample question is simply a fun way to practice critical and creative thinking. 7) Determine both one-word answers. A mountain I am not. 8) Use the clues to solve the puzzle. A duck, a goose, a goat, and a horse all entered the barn at different times one day last week. a. A mammal entered the barn first. b. The duck entered before the goose. c. The goose entered ahead of the horse. 9) Determine the common term or phrase depicted in these verbal picture puzzles. 10) Use the addition, subtraction, multiplication and division symbols once each to make these equations true. 11) While relaxing on the deck outside her cabin one summer evening, Vivian fell into a deep trance-like sleep. When she awoke, she felt as if she had slept only an hour or two, but it was now the middle of winter. Answer: Vivian was on the patio of her first class cabin on a cruise ship. She fell asleep just before the ship crossed the equator on a trip from Hawaii to New Zealand. The equator is the dividing line between the opposite seasons. She fell asleep north of the equator while in the middle of summer and awoke two hours later south of the equator in the middle of winter. NOTE: Other explanations are accepted. Per the rules explained in the book one person is supposed to know the actual answer and the player(s) must ask "yes" or "no" questions to deduce the answer. This sample question is simply a fun way to practice critical and creative thinking. 1) Fill the 3-liter jug three times, each time dumping the water from it into the 8-liter jug. The third time, this will leave one liter of water in the 3-liter jug, and the 8-liter jug will be filled. Dump the water from the 8-liter jug down the drain, and then empty the one liter of water from the 3-liter jug into the 8-liter jug. Now fill the 3-liter jug again and dump the water into the 8-liter jug. The 8-liter jug now contains 4 liters of water. Various answers are possible. 4) 299. The pattern involves a difference of 6 between adjacent terms of the sequence. Add 6 to 5, getting 11, then add 6 to 11, getting 17, then add 6 to 17, getting 23, etc., until 6 has been added 50 times, ending in 299. Answer explanations will vary. 6) He was the coach of a professional ball team. The team’s owner fired him because he was “sick and tired” of the team’s dismal performance. 11) Vivian was on the patio of her first class cabin on a cruise ship. She fell asleep just before the ship crossed the equator on a trip from Hawaii to New Zealand. The equator is the dividing line between the opposite seasons. She fell asleep north of the equator while in the middle of summer and awoke two hours later south of th equator in the middle of winter. 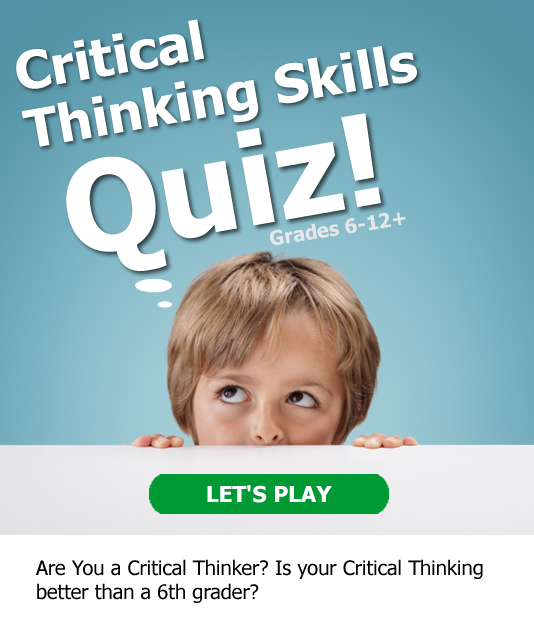 The Free Critical Thinking Quizzes are promotional quizzes, not be confused with our time tested and academically sound Cornell Critical Thinking Tests.